State elected official: Alexander Lucius Twilight, 1836. Municipal elected official: John Mercer Langston, 1855. County sheriff: Walter Burton, 1869. State Supreme Court Justice: Jonathan Jasper Wright, 1870. City mayor: Pierre Caliste Landry, 1868. U.S. Senator (appointed): Hiram Revels, 1870. Governor (appointed): P.B.S. Pinchback, 1872. 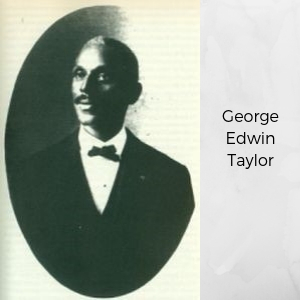 Person to run for the presidency: George Edwin Taylor, 1904. Woman legislator: Crystal Bird Fauset, 1938. 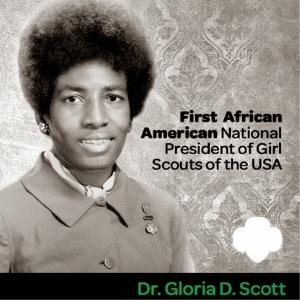 Woman Head of Peace Corps: Carolyn L. Robertson Payton, 1964. U.S Senator (elected) Edward Brooke, 1966. U.S. cabinet member: Robert C. Weaver, 1966. Mayor of major city: Carl Stokes, 1967. Woman U.S. Representative: Shirley Chisholm, 1969. Woman cabinet officer: Patricia Harris, 1977. Governor (elected): L. Douglas Wilder, 1989. Woman mayor of a major U.S. city: Sharon Pratt Dixon Kelly, 1991. Woman U.S. Senator: Carol Mosely Braun, 1992. U.S. Secretary of State: Colin Powell, 2001. 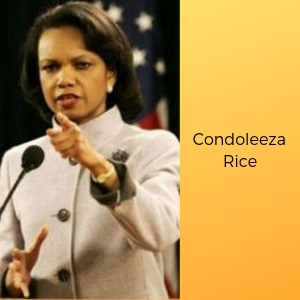 Woman Secretary of State: Condoleezza Rice, 2005. Major party nominee for President: Sen. Barack Obama, 2008. U.S. President: Barack Obama, 2009. Woman U.S. Attorney General: Loretta E. Lynch, 2015. Admitted to the Bar: Macon B. Allen, 1845. Woman admitted to the bar:Charlotte Ray, 1872. Editor, Harvard Law Review: Charles Hamilton Houston, 1919. Federal Judge: William Henry Hastie, 1946. Woman federal judge: Constance Baker Motley, 1966. U.S. Supreme Court Justice: Thurgood Marshall, 1967. President of the American Bar Association: Dennis Archer, 2002. U.S. ambassador: Ebenezer D. Bassett, 1869. Nobel Peace Prize winner: Ralph J. Bunche, 1950. Woman U.S. ambassador:Patricia Harris, 1965. U.S. Representative to the UN: Andrew Young, 1977. U.S Army unit to have black men comprise more than half of its troops: 1st Rhode Island Regiment, 1778. Commissioned officer in the U.S. Navy: Robert Smalls, 1863. Commissioned officer above the rank of Captain in the U.S. Army: Major Martin R. Delany, 1865. West Point graduate: Henry O. Flipper, 1877. Graduate of the U.S. Naval Academy: Wesley A. Brown, 1949. Congressional Medal of Honor winner: Sgt. William H. Carney, 1900. 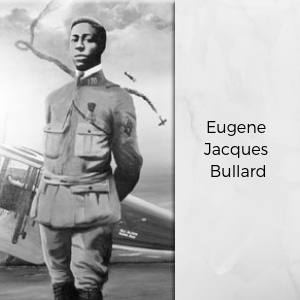 Combat pilot: Eugene Jacques Bullard, 1917. General: Benjamin O. Davis, Sr., 1940. Woman general: Hazel W. Johnson, 1979. Woman to graduate from the U.S. Naval Academy: Janie L. Mines, 1980. Chairman of the Joint Chiefs of Staff: Colin Powell, 1989–1993. Woman Rear Admiral in the United States Navy: Lillian Fishburne, 1998. Patent holder: Thomas L. Jennings, 1821. Woman patent holder: Judy Reed, 1884. Member of the National Academy of Sciences: David Harold Blackwell, 1965. Astronaut: Robert H. Lawrence, Jr., 1967. Astronaut to travel in space: Guion Bluford, 1983. Head of the National Science Foundation: Walter E. Massey, 1990. Woman astronaut: Mae Jemison, 1992. Space Shuttle Commander: Frederick D. Gregory, 1998. Hospital dedicated to black patient care: The Georgia Infirmary, 1832. M.D. degree: James McCune Smith, 1837. M.D. degree from a U.S. Medical School: David Jones Peck, 1847. Woman to receive an M.D. degree: Rebecca Lee Crumpler, 1864. Female Dental Surgeon: Ida Gray Nelson Rollins, 1890. Black-owned hospital: Provident Hospital founded by Daniel Hale Williams, 1891. Developer of the blood bank: Dr. Charles Drew, 1940. Implantation of heart defibrillator: Levi Watkins, Jr., 1980.President of the American Medical Association: Lonnie Bristow, 1995. College graduate (B.A. ): John Chavis, 1799. College professor: Charles Lewis Reason, 1849. Woman to graduate from a college, Lucy Stanton, 1850. College president: Daniel A. Payne, 1856. Non-white public high school: Paul Lawrence Dunbar High, 1870. Ph.D.: Edward A. Bouchet, 1876. .
Elected to Phi Beta Kappa, George Washington Henderson, 1877. Women Ph.D's: Georgiana Simpson, Sadie Tanner Mossell and Eva Beatrice Dykes, 1921. Ivy League University president: Ruth Simmons, 2001. Published autobiography: Briton Hammon, 1760. Poet (published): Phillis Wheatley, 1773. Recognized artist: Joshua Johnston, 1790, portraiture. Woman's autobiography: Jarena Lee, 1831. Male Novelist: William Wells Brown, 1853. Woman novelist, Harriett Wilson, 1859. Pulitzer prize winner: Gwendolyn Brooks, 1950. Poet Laureate: Robert Hayden, 1976. 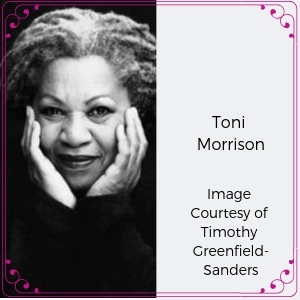 Nobel Prize for Literature winner: Toni Morrison, 1993. Woman Poet Laureate: Rita Dove, 1993. Daily newspaper: New Orleans Tribune, 1864. Published musical composition: Francis Johnson, 1817. Theatrical company: The African Company, 1821. Nationally recognized dance performer: William Henry Lane (Master Juba), 1845. Member of the New York City Opera: Todd Duncan, 1945. Member of the Metropolitan Opera Company: Marian Anderson, 1955. Male Grammy Award winner: Count Basie, 1958. 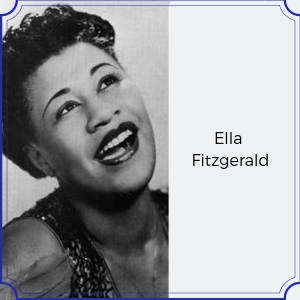 Woman Grammy Award winner: Ella Fitzgerald, 1958. Principal dancer in a major dance company: Arthur Mitchell, 1959, New York City Ballet. First African American film company: Lincoln Motion Picture Company, 1916. Film director: Oscar Micheaux, 1919. First Oscar winner: Hattie McDaniel, 1940. First Honorary Oscar: James Baskett, 1948. Tony Award Winner: Juanita Hall, 1950. Oscar, Best Actor: Sidney Poitier 1963. Director for a major Hollywood studio: Gordon Parks, 1969. Woman director for a major Hollywood Studio: Julie Dash, 1991. Oscar, Best Actress: Halle Berry, 2001. First President of the Academy of Motion Picture Arts and Sciences (The Oscars): Cheryl Boone Isaacs, 2013. Radio broadcaster: Jack L. Cooper, 1925. Black-owned radio station: WERD, purchased by Jesse B. Blayton, Sr., 1949. Network television show host: Nat King Cole, 1956. Network news correspondent: Malvin Goode, 1962. Star of a network television show: Bill Cosby, 1965. First Evening New Anchor: Max Robinson, 1978. Woman television show host: Oprah Winfrey, 1986. Jockey to Win Kentucky Derby: Oliver Lewis, 1875. Professional Golfer: John Matthew Shippen, Jr., 1896. World cycling champion: Marshall W. "Major" Taylor, 1899. Olympic medalist (Summer games): George Poage, 1904. Olympic gold medalist (Summer games): John Baxter "Doc" Taylor, 1908. 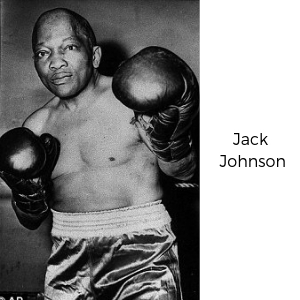 World Heavyweight boxing champion: Jack Johnson, 1908. NFL football coach: Fritz Pollard, 1922–1937. Olympic gold medalist (Summer games; individual): DeHart Hubbard, 1924. Major league baseball player in the 20th Century: Jackie Robinson, 1947. Woman gold medalist (Summer games; individual): Alice Coachman, 1948. NFL quarterback: Willie Thrower, 1953. Wimbledon tennis champion: Althea Gibson, 1957. NHL hockey player: Willie O'Ree, 1958, Boston Bruins. NASCAR stock car driver to win a major race: Wendell Oliver Scott, 1963. Male tennis champion: Arthur Ashe, 1968. Olympic medalist (Winter games): Debi Thomas, 1988. Golf champion: Tiger Woods, 1997. Female Olympic gold medalist (Winter games): Vonetta Flowers, 2002. Male Olympic gold medalist (Winter games; individual): Shani Davis, 2006. Female Licensed Nascar Driver: Tia Norfleet, 2016. Baptist Church:David George and the Silver Bluff Baptist Church, 1773. African Episcopal (AME) Church: Mother Bethel AME Church, 1794. Church-Sponsored African American College: Wilberforce University, 1856. Pentecostal Faith Revival: William J. Seymour and the Azusa Street Revival, 1906. National Black Catholic Fraternal Order: Knights of St. Peter Claver, 1909. Woman Bishop in the Episcopal (Anglican) Church: Barbara Harris, 1989. Woman Bishop of the African Methodist Episcopal (AME) Church: Vashti Murphy McKenzie, 2000. Landowners: Anthony and Mary Johnson, 1640. Black-owned insurance company: The African Insurance Company, 1810. Black Labor Union: American League of Colored Laborers, 1850. Black-owned Bank: True Reformers Bank, 1889. Black-owned resort: Highland Beach, Maryland, 1893. Millionaire: Robert Abbott, founder of the Chicago Defender in 1905. Automobile manufacturing company: C.R. Patterson & Sons, 1915. 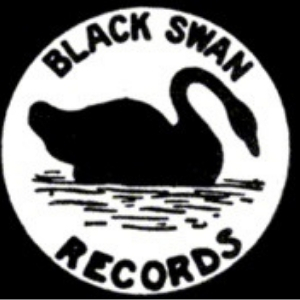 Record Company: Black Swan Records, 1921. Black-owned Youth Camp: Camp Atwater, 1921. Billionaire: Robert Johnson, 2001, owner of Black Entertainment Television. Explorer, North Pole: Matthew Henson, 1909. First Secret Service Agent, Charles LeRoy Gittens, 1956. Licensed Pilot: Bessie Coleman, 1921. Explorer, South Pole: George Gibbs, 1939–1941. Captain of an American Merchant Marine ship: Hugh Mulzac, 1942. Pilot for commercial airline: Perry Young, Jr., 1957. Flight Attendant: Ruth Carol Taylor, 1958. Woman commercial airline pilot: Jill Elaine Brown, 1978. Miss America: Vanessa Williams, 1984. Miss USA: Carole Ann-Marie Gist, 1990. President of the National League of Women Voters, Carolyn Jefferson-Jenkins, 1994. Flight around the world: Barrington Irving, 2007. Explorer, North Pole: Barbara Hillary, 2007.